Once more an expansion receives our Game of the Month recommendation. 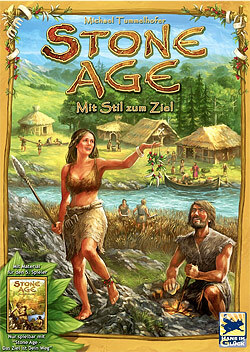 Its base game “Stone Age” has already been a winner of this title. Expanding “Stone Age” to a 5-player game by adding the required components and rules was a compulsory requirement. However, introducing jewelry and merchants to the game system is a welcomed addition (not only for female gamers) as they create a completely new dynamic to the gameplay. The resulting strategic possibilities need to be explored while jewelry as the new “wildcard” resource can to be used cleverly for the acquisition of huts and cards. This is the kind of expansion we long for. Keep up the good work!